During the time that a Chinese company was filing a patent that it said Apple’s iPhone 6 violates, hacked photos of Apple’s phone showing the contested design were released in China. The Chinese company Digione has claimed that the look of the Apple iPhone 6 is copied from its one product—a cellphone that looks very similar to the iPhone. Images of the iPhone 6 were leaked from China and widely circulated in May, before Digione’s patent was approved in China. According to documents found by Macworld, one of Digione’s subsidiaries filed the patent for its Android-based iPhone 6 lookalike, the 100+V6 smartphone, in January and it was granted by China’s State Intellectual Property Office in July. The first accurate photos of the iPhone 6 were leaked in May, and all of the initial leaks came from China. The images showed the exteriors of the phones, including the unique design with rounded corners and the various metallic color schemes. While Digione was still waiting for approval for its patent, Apple had already arranged for the iPhone 6 to be manufactured in China. Just hours before the Apple Worldwide Developers Conference on June 2, Apple’s China-based manufacturer, Foxconn, revealed it would manufacture both the 4.7-inch and 5.5-inch models of the iPhone 6. Soon after, detailed images of iPhone 6 factory parts were leaked from China in June. The images were presumably from an early production run of the iPhone 6. The images appear to be taken from a factory floor, yet details on their origin were not provided. Also in June—still a month before China approved Digione’s patent—images of a finished iPhone 6 were leaked by Taiwanese actor and singer Jimmy Lin. He showed two models, one a smaller black iPhone 6 and one a larger silver iPhone 6. Images of both phones clearly showed the Apple logo. Lin has a track record of leaking photos of unreleased Apple products. A year prior, he leaked images of himself holding the iPhone 5C. It is unclear when Apple filed its patent for the iPhone 6 design—and more importantly whether it also filed for a patent in China, since U.S. patents do not apply in China unless they’re also filed with Chinese authorities. Apple did not immediately respond to a phone call and message inquiring about when the iPhone 6 patents were filed. Digione is a smartphone company with only one main product on its website, which is the 100+V6. Its website, meanwhile, heavily mimicks the design of Apple’s website. Digione did not immediately respond to an email inquiring about its claims or whether it plans to pursue legal action. The 100+V6 has many external similarities to the iPhone 6, mainly around its casing design. Similar to the iPhone 6, it also comes in several metallic colors including silver and gold. 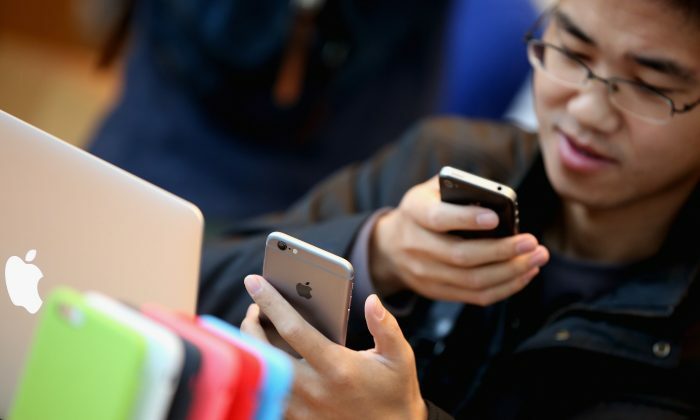 Digione posted its claims against Apple on Chinese social networking website Sina Weibo. It said it sent the claims to Apple in September, yet it appears Apple has not responded. A legal letter from Beijing-based Wis & Weals Law Firm, dated Sept. 2 and addressed to Apple Inc. said the iPhone 6 “may infringe” the patent used by Digione, which is held by Shenzhen Baili Marketing Service Inc. The legal claim against Apple could be the first of many in a new push by the Chinese regime to sue U.S. companies for patent fraud. China recently launched a patent trolling company called Ruichuan IPR Funds. The Chinese regime seeded the company $50 billion in fluff patents, which it still uses to make legal claims against companies in the United States and elsewhere for patent violations. Ruichuan IPR Funds is also currently working with several large technology firms in China, including Xiaomi, TCL, and Kingsoft. Patent trolling is a lucrative business. The companies, officially called patent assertion entities, produce no goods and instead file or buy vague and outdated patents which they then use to sue innovators. Patent trolls will typically strike deals with companies so they get an ongoing licensing fee on the patent—giving them a long-term cut of profits. Patent trolls cost the U.S. economy $29 billion a year, according to a press release from nonprofit Citizen Outreach. The initial lawsuits from Ruichuan IPR Funds will likely take place in China, where U.S. companies will be at the mercy of the Chinese regime’s courts. William Watkins, a research fellow at the Independent Institute, told Epoch Times in a previous interview that it’s not uncommon for Chinese companies to steal intellectual property from U.S. companies, file patents for the same products in China, then sue the U.S. companies in China for patent fraud. China's turn came up again on 22 October 2013 at the United Nations Universal Periodic Review Working Group in Geneva.